On the hot summer morning of Aug. 2, 1980 a massive explosion ripped apart the main waiting room of the Bologna railway station. Eighty-five people were killed and hundreds more injured. Though at first blamed on Italy’s legendary urban guerrillas, The Red Brigades, it soon emerged that the attack had, in fact, originated from within the ‘deep state’ of the Italian government itself. The full nature of this secret parallel state would only come to light a decade later when the Italian premier, Giulio Andreotti, under questioning from a special commission of inquiry, revealed the existence of arms caches stashed all around the country and which were at the disposal of an organization which later came to be identified as ‘Gladio’. The members of this group turned out to include not only hundreds of far-right figures in the intelligence, military, government, media, Church and corporate sectors, but a motley assortment of unreconstructed WW2 fascists, psychopaths and criminal underworld types to boot. And despite Andreotti’s attempts to airbrush the group as ‘patriots’ it appeared evident to much of the rest of the Italian polity that these seemed rather more like pretty bad folk indeed. Little did they know. Follow-up research by the likes of Daniele Ganser, Claudio Celani, Jurgen Roth and Henrik Kruger traced connections to similar groups spread throughout Europe of which all were found to be deep state terrorist organizations, and all of which were found, ultimately, to be subservient unto the highest levels of the CIA and NATO command structures. The moniker ‘Gladio’ (after the two-edged sword used in classical Rome) was eventually broadened to include a bewildering host of related deep state terrorist structures including: ‘P2’ In Italy, ‘P26’ in Switzerland, ‘Sveaborg’ in Sweden, ‘Counter-Guerrilla’ in Turkey and ‘Sheepskin’ in Greece. This (hardly definitive) European list was then found to have connections not only to virtually every US sponsored secret state terrorist organization the world over (including the likes of Operation Condor in Latin America), but also to many of the global drug cartels that provided the secretive wealth needed to fund and otherwise lubricate the whole rotting, corrupt shebang. If all this sounds sinister enough, it pales in light of the detailed structure of the dazzlingly diabolical Gladio edifice. 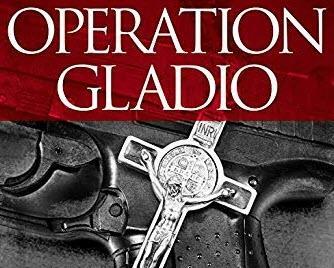 And it is to those details we now repair vis a vis an overview of the remarkable, if otherwise unheralded, 2015 work by journalist Paul L. Williams entitled, ‘Operation Gladio: The Unholy Alliance Between the Vatican, the CIA and the Mafia’. Though there are other books on the subject worthy of honourable mention (including Daniele Ganser’s seminal tome, ‘NATO’s Secret Armies’, and Richard Cottrell’s recent and stylishly written, ‘Gladio: NATO’s Dagger at the Heart of Europe’), it is to Williams that I believe we owe a particular debt of gratitude in having provided a more or less fully integrated portrait of the global machinations of Operation Gladio. Before embarking on our grim, if yet fascinating, journey it is worth first noting that whilst ‘Gladio’ was officially acknowledged and condemned by the European Parliament (in Nov., 1990; Washington and NATO having ever after refused ‘comment’ on the matter), and its multifarious organs and factions ordered dismantled, it is hardly likely that the latter was ever fully enacted. The historical context of ‘Gladio’, then, is really the quintessential backdrop to understanding the trademark false flag events of the modern era. The general origins of this labyrinthine network of deep state actors lay in the so-called ‘stay-behind-armies’ set up at the end of WW2 by the Allied powers (principally the US) ostensibly to act as resistance forces should the Soviets ever decide to invade Europe. Quickly, however, the raison d’etre of the ‘armies’ transmogrified into a mission to counteract, not external invasion, but ‘internal subversion’. Such would eventually result in the undermining not just of post-war European socialism, but of Italian, Greek – and later global – democracy itself. But we get ahead of ourselves. The primal author of the ‘stay-behind-armies’, Williams informs us, was General Reinhard Gehlen, the head of German military intelligence during the Second World War. Having foreseen early on that the Reich was doomed to defeat, Gehlen had “concocted the idea of forming clandestine guerilla squads composed of Hitler youth and die-hard fascist fanatics” ostensibly to fend off the inevitable Soviet invasion. These guerilla units he referred to as ‘werewolves’. Not ones to miss a fascist opportunity when they saw it, the US Office of Strategic Services (the OSS, and the forerunner of the CIA), under the leadership of William ‘Wild Bill’ Donovan, quickly enlisted both Gehlen and SS General Karl Wolff (in 1945) in forming the Gehlen Organization (later to transform into the present-day German BND) and which received its initial funding from US Army G-2 intelligence resources. The American point-man on this was Allen Dulles, the first president (in 1927) of the Council on Foreign Relations, and later the first head of the CIA. Duly incorporated into the American fold, the ‘werewolves’ were, given that their initial meddling took place in Italy, rebranded as ‘gladiators’. Operation Gladio was born. In 1947 the CIA (having, that year, superseded the OSS) was faced with its first daunting task, i.e. how to prevent the Italian Communist Party (PCI) from forming the next government. Elections were scheduled for 1948 and the PCI was a virtual shoe-in not just in Italy proper, but in Sicily as well. Fortunately, ‘Gladio’ was ready and waiting. The gladiators had been training in a special camp set up in Sardinia under the local command of the former WW2 Italian fascist leader, Prince Junio Valerio Borghese. In addition, hundreds of American mafioso began to arrive on the shores of Italy to lend a hand with the communist ‘problem’. The arrival of the ‘made men’ was the result of Donovan’s efforts from 1943 onward in working with American mobsters Charles ‘Lucky’ Luciano and Vito Genovese to conger new (drug) funding for the OSS’s off-books’ operations, and to reinstall the Sicilian mafia on the island in the leadup to Operation Husky (the Allied invasion of Sicily). These forces were now unleashed on the Italian electorate, and through 1948 an average of five people a week were murdered by the CIA-backed terrorist units. The results were grimly predictable. Hallelujah, the PCI were defeated and the Christian Democrats returned to power. Still, the threat remained. Fully half the Italian electorate were communist sympathizers and, moreover, leftist politics pervaded much of the rest of the diseased European body. More would have to be done. The problem, however, was money. There simply wasn’t enough of it. Thus, the initial $200 million in funding for Gladio (which had come from the Rockefeller and Mellon foundations) was quickly exhausted. And though the National Security Act of 1947 had provided the loophole that allowed for the CIA’s covert operations, it had not allowed for their overt Congressional funding. There lay the rub. Thankfully, Paul Helliwell knew how to salve the itch. Paul Helliwell was an inner member of the original OSS (along with key scions of the Morgan, Mellon, Vanderbilt, Carnegie, DuPont and Ryan families) and, according to Williams, likely the greatest unsung hero of the nicknamed ‘Oh-So-Social’ club. It was he, who having cut his teeth in the drugs-for-arms trade by shepherding opium deals with the Kuomintang (KMT, the Chinese National Army fighting against Mao Zedung), conjured the brilliant inspiration to do the very same thing – in the United States itself. Thus, it was at his suggestion that Donovan elected to forge the deep bond (and that exists to this day) between the nation’s intelligence services and organized crime. Enter stage left such notables as ‘Lucky’ Luciano, Vito Genovese, Meyer Lansky and the Trafficante and Gambino crime clans. Quickly the streets of, first, New York, and later many an American metropolis, were flooded with heroin. These early, halcyon days would soon lead to the infamous ‘French Connection’, thence to the ‘Golden Triangle’ (where the CIA’s very own ‘Air America’ transported drugs out of South East Asia during the Vietnam War) and, later, to the Balkan, Mexican, and Colombian drug cartels. All very well and good. But, to begin with, there was yet a fly in the whole drugs-for-arms-for-terror ointment. To wit: how to pay off the mafioso without anyone noticing; indeed, how to stash, launder and hide all of this financial derring-do from the prying eyes of the authorities; you know, the real-enough authorities, the Treasury cops and so forth. How do you do that? Article 2 of the Lateran Treaty of 1929 was clear and unequivocal. The Article, which served to regulate matters between the Holy See and the Italian state, expressly forbade any interference of the latter in the affairs of the former. It is hardly conceivable, of course, that the framers of the Treaty ever foresaw what such immunity could actually mean in practice. But then they probably hadn’t reckoned on the fiendish formation of the Institute for Works of Religion (IOR), or more colloquially, the Vatican Bank. Established by Pope Pius XII and Bernardino Nogara in 1942, the Bank would quickly come to serve as the principal repository post-war both for the Sicilian Mafia and for the OSS/CIA wherein all of the monies and documents relating to drug trafficking and to Gladio would be stored and laundered. Already in 1945 the pope had held private audiences with Donovan to discuss the implementation of Gladio and where, as Williams reports, Donovan was knighted as an anti-Communist crusader with the Grand Cross of the Order of Sylvester. Prior to this time Pius XII had proven himself a loyal ally in working with Dulles and the OSS to establish the ratlines used to help prominent Nazis escape Europe. Now, new horizons beckoned. The first duty at hand, of course, was to destroy the communist menace in respect of the 1948 elections. To this end the pope authorized his own terror squads (under Monsignor Bicchierai) to assist the gladiators and the ‘made men’ in intimidating the Italian electorate. Task accomplished. The second duty at hand, however, was longer term. Communism, socialism and, indeed, any Godless form of progressive government, anywhere, had to be stamped out at source. For this money would be needed. Lots of money. Untraceable money. Drug money. Now in the months before the 1948 election the CIA deposited some $65 million into the Vatican Bank. The source of these monies came from heroin produced by the Italian pharmaceutical giant, Schiaparelli, and which was then transported by the Sicilian mob into Cuba where it was cut and then distributed to New Orleans, Miami and New York by the Santo Trafficante family. Lucrative though this trade was, it was not nearly enough to suit the needs of the CIA and ‘Gladio’. More would be required. More drug networks and more banks. Gladio was about to global. To start with a new alliance was forged with the Corsican mafia. Unlike the Sicilian mob, the Corsicans had extensive experience in processing heroin, a skill they had picked up through years of working with Laotian, Cambodian and Vietnamese technicians in French Indochina. A supply route then emerged running from Burma through Turkey to Beirut and thence to Marseille. Alas, there was a slight hitch when the leftist dockworkers in Marseille, being sympathetic to the rebel army under Ho Chi Minh, refused to load and unload the boats from Indochina. No worries. A deft bit of terror administered by the Corsican boys (and funded by the CIA), and problem solved. By 1951, then, Marseille had become the center of the Western heroin industry. Voila, the ‘French Connection’. Meanwhile, Wild Bill Donovan had ‘resigned’ from the CIA to form the World Commerce Corporation (WCC) whose primary function was to facilitate the arms-for-drugs deals with the KMT. Paul Helliwell lent a needed hand at the helm by heading up Sea Supply, Inc., a CIA front company gainfully employed in shipping heroin from Bangkok. By 1958 the whole operation was so successful that a second supply route was established running through Saigon. Here, the help of Ngo Dinh Diem, the US installed despot of South Vietnam, proved invaluable. Still, there was a potential cloud on the horizon, i.e. word of all these shenanigans was bound to leak out. What to do? The first reflex, naturally, was to pin the blame for the West’s growing heroin problem on the Communist Chinese under Mao Zedung. Check. The second, more considered response, was to organize an ongoing campaign to deflect attention away from, and burnish the image of, the CIA. And to this end, in 1953, did the CIA establish ‘Operation Mockingbird’. Under ‘Mockingbird’ the Agency recruited hundreds of American journalists to spread false stories and propaganda about the Company’s ‘benign’ activities. Eventually, this depraved fabric of anti-journalism enlisted entire news networks including ABC, NBC, Newsweek, Associated Press, and The Saturday Evening Post. Now the guys and gals at Langley could relax. Henceforth, American (and global) eyes were dutifully prismed through the rose-coloured lens of ‘Mockingbird’. Though a full elaboration of this bewilderingly complex financial system is best left to the author, it is worth briefly savouring a few highlights. To begin with Sindona purchased Fasco AG, a Liechtenstein holding company and through which he purchased his first bank – the Banca Privata Finanziaria (BPF). The BPF then became, by way of a Chicago-based intermediary bank, Continental Illinois, a principal conduit for transferring drug money from the IOR for the purposes of Gladio. In fact, it was this banking pipeline in particular which provided the filthy lucre that fueled the 1967 coup d’etat in Greece. But more on this heady stuff in a bit. It was through his Chicago contacts that Sindona first met Monsignor Paul Marcinkus, popularly known as ‘the Gorilla’. The Gorilla was six foot four, “a gifted street fighter…and a lover of bourbon, fine cigars and young women”. Under Sindona’s patronage Marcinkus would soon rise to become both Pope Paul VI’s personal body guard and the head of the IOR. A third musketeer in the person of Roberto Calvi (the assistant – and later full – director of the famous, Milan-based Banco Ambrosiano) came to complete the three Vatican amigos. Together they would cut a dramatic, collective figure in the global banking underworld all through the ‘anni di Piombo’ (the Gladio ‘years of lead’ in Italy from 1969 to 1987). Exactly how dramatic is illustrated, par excellence, by Calvi’s eventual dark demise. Who among us, old enough to remember, can forget the macabre spectacle (June, 1982) of Calvi’s body hanging from Blackfriars Bridge, his feet dangling in the Thames and pockets stuffed with five masonry bricks. Sindona would also later be murdered (1986) by means of a cyanide-laced cup of coffee whilst in jail and under ‘maximum protective custody’. Calvi was a key figure in establishing a series of eight shell companies (six in Panama, two in Europe) through which drug lords like Pablo Escobar in South America were encouraged to deposit their ill-gotten loot. (The CIA put shoulder to wheel by helping ferry the Escobar cocaine in a fleet of planes operating out of Scranton airport in Pennsylvania). The monies were then transferred via Banco Ambrosiano to the IOR which took a 15 to 20 percent processing fee. From there funds were distributed to a host of European banks set up by Sindona for use by Gladio units spread throughout the continent. In addition to the flow of cash from the cartels, funds were bled from Banco Ambrosiano into the eight shell companies – again for use by the CIA in funding its covert operations. This points up a general operating procedure of the entire Gladio ‘banking’ system, i.e. the system, far from being designed to turn a profit, was expressly designed to ‘lose’ money; that is, to have it siphoned off into covert ops. Such explains the regular and spectacular failure of a host of CIA-related banks including: Franklin National Bank (purchased by Sindona), Castle Bank & Trust, Mercantile Bank & Trust (both set up by the ubiquitous Paul Helliwell), Nugan Hand Bank (in Australia, and from which funds were diverted to undermine Prime Minister Gough Whitlam during the Vietnam War), and the infamous Bank of Credit and Commerce International (based in Karachi in aid, primarily, of the Southeast Asian heroin trade). Indeed, it was precisely the collapse of Banco Ambrosiano itself that brought both Calvi and Sindona to their untimely ends. Finally, it is worth noting here that these august institutions were linked in a tight criminal embrace with many of the most prestigious financial firms in America including Citibank, the Bank of New York, and the Bank of Boston. The base of the iceberg, in short, extended far and wide. But then, what was all this money really doing? Following the thwarting of Italian democracy in 1948 the Gladio ‘secret armies’ entered into a period of what one might characterize as pregnant incubation. Thus, it was during the 1950s that the various drug supply routes and financial networks were being created, as were some of the principal political organizations. Probably the most important of the latter was ‘Propaganda Due’ otherwise known as ‘P2’. Created in 1877 as a Freemasonry lodge for the Piedmont nobility, it was banned by Mussolini in 1924 only to be resurrected post-war with the approval of Allen Dulles, himself a thirty-third degree Mason. The lodge, though at first dominated mainly by spooks, spies, military and mafia figures, would soon encompass a who’s who of Italian political, corporate, banking and media supremos to boot. Indeed, the organization would eventually spread shoots throughout Europe as well as North and South America, and its members would come to include such luminaries as Henry Kissinger and General Alexander Haig. A ‘P2’ denizen of especial significance was Licio Gelli. The latter’s pedigree was impressive: a former volunteer in the 735th Black Shirts Battalion, a former member of the elite SS Division under Field Marshall Goering and, thereafter, a chummy employee of the US Counter Intelligence Corps of the Fifth Army. Working with William Colby, the OSS agent in France, and Allen Dulles, the OSS director, Gelli soon gained entry to the Vatican where he helped set up the Nazi escape routes to Argentina. His ties with Argentina would later prove critical in facilitating Operation Condor (the US-backed mass assassination program in 1970s and ‘80s South America). Moreover, in 1972, Gelli would emerge as P2’s supreme ‘Worshipful Master’ under whose leadership the lodge would reach its full, horrific flowering. Finally, it is worth mentioning at this juncture that it was as a result of a police raid on Gelli’s villa in 1981 that the full, tentacled structure of Gladio would come to light. But we digress. One of the first substantive actions of Gladio was the Turkish coup of 1960. Here the incumbent Prime Minister, Adnan Menderes, made the fatal mistake of believing he was really in charge and thereafter initiating a visit to Moscow to secure economic aid. The ‘stay-behind-army’ in Turkey known as Counter-Guerilla, in alliance with the Turkish military, quickly disabused him of any such delusions by arresting and executing him. Throughout the 1970s both Counter-Guerilla and its youth wing, the Grey Wolves, would stage “ongoing terror attacks…that resulted in the deaths of over five thousand students, teachers, trade union leaders, booksellers and politicians”. Counter-Guerilla would also figure in the Turkish coup of 1980 when its commander, General Kenan Evren, toppled the moderate government of Bulent Ecevit. According to Williams, US President Jimmy Carter phoned in his approval to the CIA station-chief in Ankara, Paul Henze, with a jubilant, ‘Your boys have done it!’ What they had done, of course, was set up a tyranny in which thousands more would be tortured while incarcerated. The Turkish Gladio boys would also be unleashed in the 1980s upon the PKK – the Kurdistan Workers Party. All of this was in keeping with Zbigniew Brzezinski’s (Carter’s national security advisor) core vision of the importance of controlling Central Asia to which Turkey was both a vital portal and, thus, a key NATO ally. Alas, Gladio would prove something of a disappointment in France, where, after having backed a series of assassination attempts against the regrettably too independent President Charles de Gaulle, it found itself on the receiving end of de Gaulle’s boot. Actually, it was NATO itself – at the time, headquartered in Paris – that was unceremoniously kicked out of France (in 1966, whence it took up its present cozy and famously corrupt abode in Brussels). But, of course, de Gaulle was ahead of the curve and understood all too well who was really behind the mayhem and murder. Greece, unfortunately, did not fare as well. In 1967 the ‘Hellenic Raiding Force’, a franchise of Gladio and playing to a NATO authored script entitled Operation Prometheus, overthrew the left-leaning government of George Papandreou. The ensuing military dictatorship would last until 1974 though this would hardly signal the end of Greece’s tribulations. From 1980 until near the turn of the millennium, the nation would suffer under a reign of terror and political assassinations nominally attributed to ‘November 17’, an alleged Marxist revolutionary group, but which in fact (and here I briefly tag-team with authors Cottrell and Ganser) was yet another faction of Greek-Gladio known as ‘Sheepskin’. This illustrates a point originally brought home by Ganser’s research to the effect that virtually every alleged ‘leftist revolutionary’ group said to have been operating in Europe throughout the post-war years was, in truth, either a Gladio ‘secret army’ unit or else had been completely infiltrated by state intelligence services, and was subsequently being steered by them for Gladio-style state-terrorist ends. Such is well documented for the ‘Red Brigades’ in Italy and the ‘Baader-Meinhof Gang’ in Germany (the ‘gang’ being conveniently and cold-bloodedly exterminated on the ‘night of the long knives’, Oct.18, 1977, whilst under custody in Stammheim prison). It also, just by the by, speaks to the universally attested prior association of many a modern-day ‘terrorist’ and their police and intelligence handlers. In Spain, during the early ‘70s, Stefano delle Chiaie and fellow Gladio agents from Italy provided their consulting expertise to General Francisco Franco’s secret police who conducted over a thousand violent acts and some fifty murders. Following Franco’s death in 1975, delle Chiaie moved to Chile to lend a fatherly hand in helping the CIA-backed Augusto Pinochet set up his death squads. In later years the Spanish Gladio unit would find gainful employment hunting down and assassinating the leaders of the Basque separatist movement. Of Italy we have already mentioned the ‘years of lead’, but just to capture a few highlights. The ‘strategy of tension’ unleashed in 1969 in Italy – the same year ‘Condor’ was unleashed in Latin America – was in response to the renewed popularity of Communism throughout the country and which, itself, was partly in response to the uptick in revolutionary sentiment globally as a result of antipathy towards the US war on Vietnam. The antidote, naturally, to this woeful state of progressive affairs was a healthy dose of terror. According to Williams, “Henry Kissinger, Nixon’s National Security Advisor, issued orders to Licio Gelli through his deputy, General Alexander Haig, for the implementation of terror attacks and coup attempts.” The terror attacks began on December 12, 1969 when a bomb exploded in the crowded lobby of a bank in Milan’s Piazza Fontana in which seventeen people were killed and eighty-eight injured. Over the ensuing years (from 1969 to 1987) there followed more than ‘14,000 acts of violence with a political motivation’. The most infamous of these was, of course, the Bologna bombing in August of 1980 and which led to the initial exposure of Gladio in Italy. Of the many attempted coups and related high-level political machinations engineered by Gladio forces in Italy (1963, 1970, 1976) and Sicily (more or less continually on tap throughout the decade), the kidnapping on March 16, 1978 – and murder a month or so later – of Prime Minister Aldo Moro was likely the most sensational. Moro had dared to include communists in his new coalition government. At first blamed on the usual suspects, i.e. the Red Brigades, further investigation (to begin with by journalist Carmine ‘Mino’ Pecorelli who paid with his life) led to the real usual suspects including CIA operative Mario Moretti (eventually convicted of the killing) and thence up the line to Gelli, then to Italy’s interior minister Francesco Cossiga and onwards to Zbigniew Brzezinski. The high-level intrigue did not stop at the murder of a prime minister however. At least two Popes felt the sharp end of the Gladio sword as well. In August of 1978, Pope Paul VI died. His successor, the preternaturally timid John Paul I, soon gave his handlers a very real shock when, after looking at the IOR accounts, he issued a ‘call for reform’. The very next day the otherwise fastidiously health-conscious pontiff – in office barely a month – was dead. Not just dead but expired with the telltale bulging eyes and horrific grimace of acute poisoning. His autopsy was definitively thwarted by an illegal and hastily contrived embalming, and his personal papers disappeared without a trace. Archbishop Marcinkus, having been temporarily removed prior, was returned to office whilst Calvi and Sindona, also under scrutiny at the time, breathed a (temporary) sigh of relief. Having been (almost) burned once the overseers of Gladio made sure to engineer the follow-up Papal succession. Thus did Cardinal Karol Wojtyla shuffle onto the historical proscenium as Pope John Paul II. Now, at first, John Paul worked seamlessly with the CIA and Gladio. Together they oversaw the destruction of Liberation Theology in Latin America, the continued undermining of Italian democracy, and the dispensing of black funds for Solidarity in Poland. Ah, but how the best laid plans do oft go astray. By the spring of 1981 not only were events spinning out of control for Gladio itself, but so too were they for Banco Ambrosiano, and by extension, the IOR. The Pope, inexplicably, refused to act. Compounding this lapse was an unaccountable trifecta of moral turpitude that witnessed the Holy Father suddenly breaking into treasonous song singing the benefits of rapprochement with the Soviets; recognition of the Palestine Liberation Organization; and, egads, nuclear disarmament. The order from on high was given: ‘Kill the Pope’. But best blame it on the Soviets. So issued the ‘Bulgarian Thesis’ wherein a lowly Bulgarian airline employee (Sergei Antonov) was set up as the patsy. In truth, the key actors in the Papal plot came straight from Gladio central casting. The starring role in the drama fell to General Giuseppe Santovito, the head of Italy’s military intelligence (SISMI) and the commander of the Italian Gladio units. His co-star, Theodore Shackley, was the infamous CIA mastermind who had already served as executive producer on such epics as Operation Phoenix (involving the murder of some 40,000 non-combatants in Vietnam), Operation Condor, the setting up of Nugan Hand Bank, and, along with delle Chiaie, the murder of Salvador Allende. West Germany’s BND (the national security services) garnered a significant credit by harbouring and financing the two actual assassins, Mehmet Agca and Abdullah Cath (both from Turkish Gladio). And, of course, the Mighty Wurlitzer, i.e. Operation Mockingbird, figured prominently in the aftermath grinding out endless tunes on the ‘Bulgarian Thesis’ – despite the fact of Agca’s eventual (lone) conviction in the shooting. The production ended all somewhat anticlimactically when the Pope (on May 13, 1981) was only seriously wounded. In a fascinating denouement, however, on Christmas Day 1983, the Pope opted to publicly forgive Agca. Italian state television was allowed to record the moment when John Paul asked his assassin from whom he had received his orders. Leaning forward to hear Agca’s response the Pope appeared momentarily frozen, then clasped his hands to his face. Though the Pontiff kept it secret, there was little need to guess at the answer. The adventures of both Agca and Cath are the stuff of legend. Indeed, Cath figures in events well beyond the time line of Gladio proper, enough to suggest that Gladio never really shut down at all. But that, as they say, is a whole other story – and one I leave to the author to take up. Paul Williams has made a fine contribution here. Certainly, if the day ever comes when, seated across from some smug establishment interlocutor, you are taken to task for being a ‘conspiracy monger’ – well, you need only lean back, smile gently, and utter but two words….’Operation Gladio’. There seems to be a distinct dividing line between covert operations before 1963 and after 1963. The murder of Aldo Moro in Italy, Chilean Ambassador Orlando Letelier and that of Salvador Allende, leader of Chile are the biggest stories, but they did not involve the clear communist-Western or fascist-communist-democracy dialectics that prevailed in the 1940's to the mid 1960's. Most of the Gladio material focuses on blurry information. After the murder of JFK and the downfall of Khrushchev, none of the semi-sensational events that followed could live up to the drama of the founding of the CIA, the Cuban Missile Crisis, the personalities of Khrushchev, FDR, Churchill, Stalin etc etc. I think that it's because Communism became only partially a pariah, the old Nazis like Bormann, Eichmann and company died off and only the Argentinian Generals in Argentina really carried on the true historical fascist tradition of Hitler, Mussolini and friends. It's no longer "Red China" like it used to be. Now Communist China and Communist Vietnam are considered to be wonderful--just as American as apple pie. Maybe sometime soon, we will see again the COPS AND ROBBERS, or COWBOYS AND INDIANS drama revive in international relations. But for now, things like Operation Gladio in Italy and the Bader-Meinhof Gang in Germany seem like repetitous James Bond sequels. The forerunner of Gladio was the British operation in post-WW1 Germany, when a large & systematic campaign of assassination was waged to eradicate the center & center-Left, creating the desired polarisation from which sprang the carefully nurtured Nazi movement. Amazon put out a series called Babylon Berlin which prominently features these events.